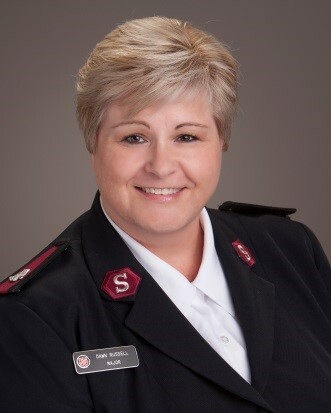 For the past fifteen years Major Dawn Russell and her husband have served Salvation Army officers in communities across the Midwest including: Gary, Indiana, Kalamazoo and Lansing Michigan, Fergus Falls, Minnesota, Burlington Iowa, Green Bay, Wisconsin and currently Traverse City, Michigan. Major Dawn came from humble beginnings. She was raised by a single mother on welfare and lived in HUD housing projects on the south side of Madison Wisconsin. A home visit from a Salvation Army soldier asking her mom if Dawn and her siblings would like to attend Sunday School was her first step on a lifelong journey of faith, compassion and serving neighbors in need. “I understand the needs and issues that plague the underprivileged because I was one of them. I know what it feels like when your food stamps don’t last the whole month and the only thing staring at you for dinner is a potato or popcorn. I know what it feels like to wish for a daddy but the daddy never comes.” “I made some wrong choices as a teen and found myself being a single mother at the young tender age of 18. I married the father of my child at a young age and became a CNA. I soon had my second child but a few years later, my marriage ended and I found myself on welfare, which I vowed never to be on. I had to learn to break the cycle of poverty and make something of myself for my children’s sake. I wanted them to be proud of their mom; I took classes and put out at least 50 applications and landed an amazing job.” A few years later, God sent me the perfect soul mate and I married him in April of 1995. My husband Jeff changed and saved my life. Prior to entering The Salvation Army School for Officer Training, Major Dawn worked in a hospital lab for over 13 years which she attributes to hard work and perseverance to a pathway of hope. “Being called to The Salvation Army was the best thing the Lord did to our family. It afforded us to continue our education with Olivet Nazarene University in Bourbonnais Illinois. I never would have believed that a girl raised on public assistance would ever travel to Israel or Turkey, as we did, as part of our biblical education or to London, UK for The Salvation Army’s 150th anniversary. We have been highly blessed and favored by God and the willingness of The Salvation Army to help us in expanding our mission field.” Major Dawn has also been on a mission trip to Kingston Jamaica where she saw poverty at its worst. Her passion is to meet the needs of children and be a beacon of hope, to children that reminds her of herself. Major Dawn’s mission is to serve suffering humanity as well as bringing the message of Jesus Christ to a world in need.